We, in the Nine house, love a good cherry or two. So much so that when we head north on our Summer vacation, we always go to the Cherry Festival in Traverse City, Michigan and the all cherry store called the Cherry Republic! You would love this store, you can literally sample almost every single cherry item. The sour cherry balls are my favorite but let me tell ya, the cherry pie filling there is to die for. I buy a couple jars and save for special cherry desserts and this is one of them! 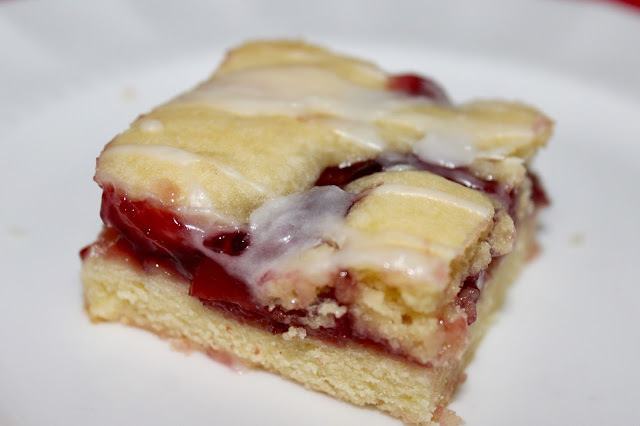 These scrumptious bars with the powdered sugar glaze get better with each day. And how customizable to try all different fillings. Next up this summer I'll try peach and then apple for the Fall. Great for company or potlucks as it makes a whole sheet pan. Preheat oven to 350°. 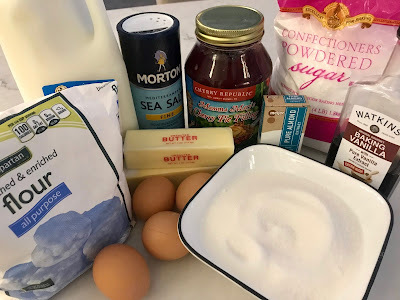 In a large bowl, cream butter, sugar and salt until light and fluffy. Add eggs, one at a time, beating well after each addition. Beat in extracts. Gradually add flour. Spread 3 cups dough into a greased 15x10x1-in. baking pan. 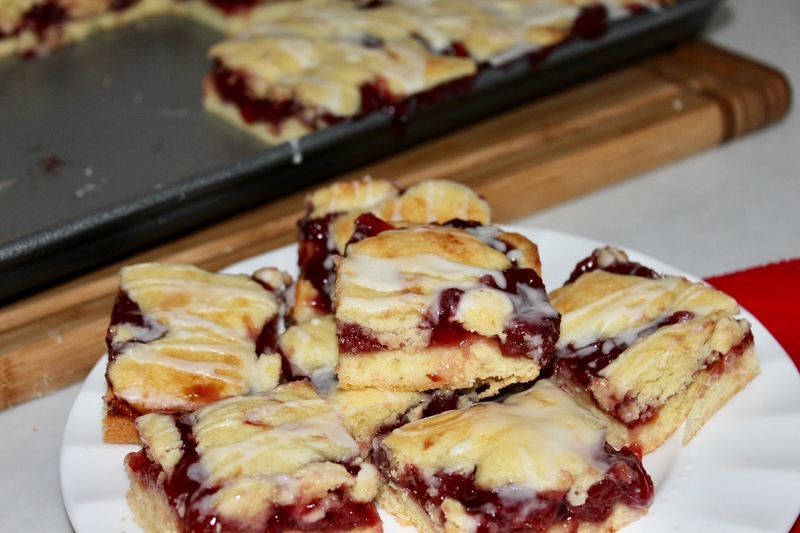 Spread with pie filling. Drop remaining dough by teaspoonful’s over filling. Bake 35-40 minutes or until golden brown. Cool completely in pan on a wire rack. For Glaze: In a small bowl, mix confectioners' sugar, extracts and enough milk to reach desired consistency; drizzle over top. Yield: 5 dozen. I think my hips just got a little bit bigger just looking at the picture! Oh my goodness! Yummy! You always make the best things! This just screams summer to me and makes me so excited for summer weather and summer food! My parents always have a huge 4th of July picnic and have cobblers for the homemade ice cream, but I'm going to bookmark this to make too as something different for the ice cream! My sweet dad LOVEs cherries and his birthday is in a few weeks, looks like I have another one of your recipes to make! You are so talented my friend, I swear EVERYTHING you make is just as fabulous as YOU! 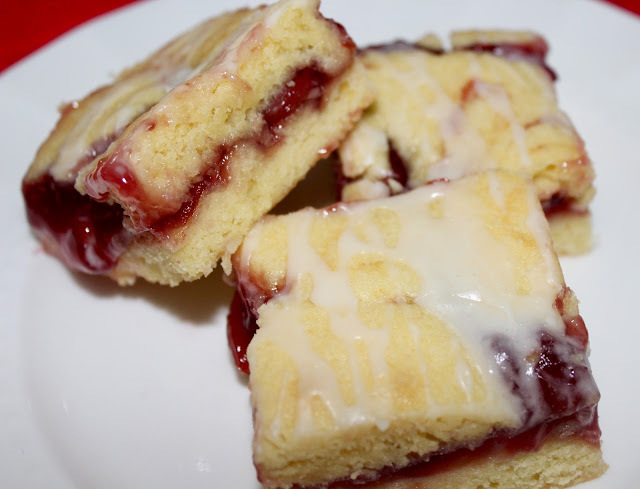 Oh cherry desserts are one of my most favorite. This looks heavenly! Cherry is one of my absolute favorites!!! I love the fruit and any dessert/snack that is flavored cherry. The place where you get that filling from sounds like heaven. Sour cherry balls. MMMM!!!! This looks so delicious! These look amazing! I love recipes that make a big batch so you only need to make one of them! 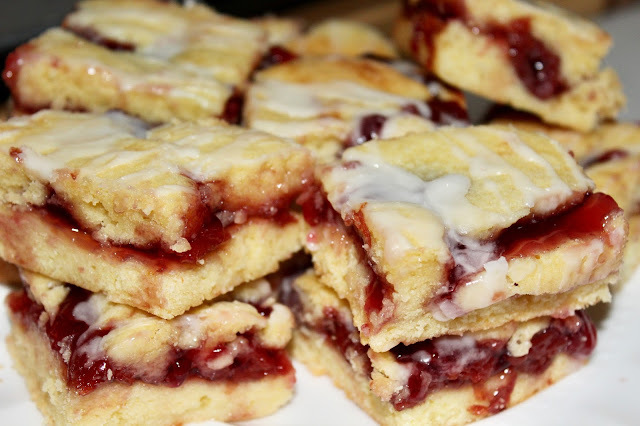 I love sour cherry desserts. 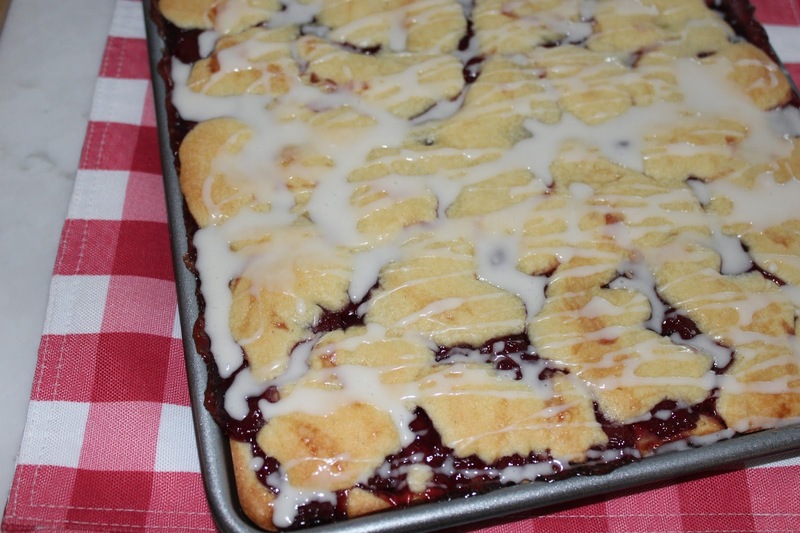 I buy a 10 pound bucket of cherries from northern Michigan each year - so I can make cherry desserts all year long. Ooooh, yum! These look absolutely scrumptious and pretty too. 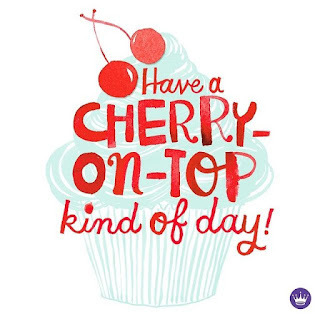 I am a sucker for cherry and berry desserts! 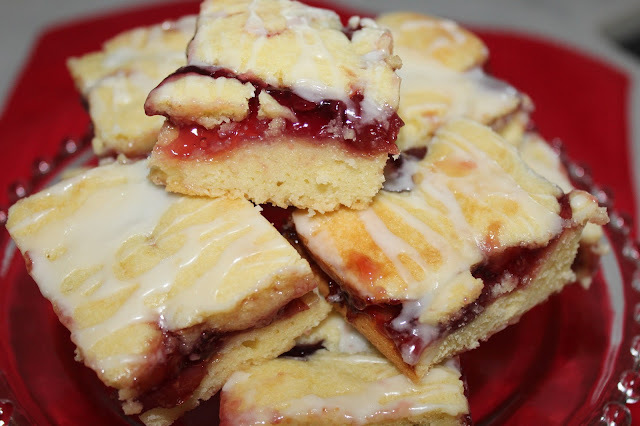 These look delicious, and I bet you're loving the baking experience in your new kitchen! Right? I'm not a baker, but I'm slowly working on getting my kitchen organized to the point of being able to have all my stuff in one area if I did want to bake! I learned a new word today thanks to my blonde, beautiful friend: "customizable." I guess I have a limited vocabulary! Lol! Mmmmm! Good stuff, Mama!! You really had me at "powdered sugar glaze," though! Yum, yum, yum, YUM!!! You are a domestic goddess! These look so amazing! Oooh, don't these look incredible!? I want to make them immediately! These look divine! Now, if only I could convince the mr. that cherry flavored food is good. He is completely crazy and won't eat it. Oh heavens momma...those look amaze balls! My kiddos would eat these up! And they're perfect for Valentine's Day! Another fantastic recipe by Andrea! These look truly scrumptious. As are you! Must try them. My tummy says thanks! Hugs, x.
I love anything with cherries. This looks delicious!! Andrea... how do you keep that cute little figure of yours when you make such yummy stuff? These look so darn good I can almost taste them. Enjoy your week. I'm going to have to show these to Alec; he LOVES cherries and I bet he'd have ball making this recipe. Pinned. Sounds so yummy! I want to try this and with peaches too! My daddy loves cherries and he has a birthday coming up. I know what I will be making! 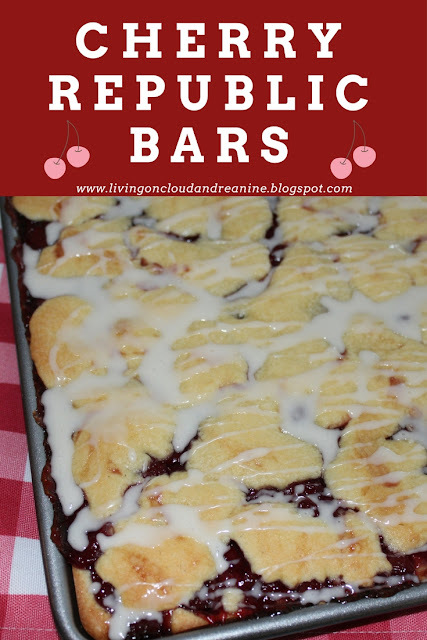 Totally pinning and making these for our next get-together!! They have my mouth watering! Yummy in the tummy! The Urban Farmer loves cherry desserts so this will have to go in our recipe library. The Uber SIL loves cherry pie so I will send this to my daughter. xoxo P.S. Hope you are not experiencing the black ice we have down here. Oh Yumm! I've never tried anything like this before but they look divine!!! Oh gosh, these look so good. I think an apple filling would be awesome too!! Seriously, I'll make anything with almond extract in it. These look divine. :) Happy Friday...stopping by from #FridayFrivolity! Oh these look delicious! Thank you for sharing with Party in Your Pjs! Your Cherry Republic Bars look fantastic! Hope you are having a great day and thanks so much for sharing with us at Full Plate Thursday and come back to see us real soon! I grew up just south of Door county Wisconsin and picked cherries in the summer as a part time job. There is no food I like better than cherries. Cherry everything. I have a recipe like this one, too, and I can’t make it very often because I eat it all. I’ve never made it with fresh pie filling. I know it would be so much better. It’s going to happen for me now. We love Cherry Republic! We live in Ada, and we go to TC every summer. This year we also visited the original one in Glen Arbor. Its so cute! I am definitely making these for my cherry loving hubby! I love the Hot Cherry Salsa too!